The Heritage Foundation’s Dr. Ryan Anderson will deliver a talk on his new book, When Harry Became Sally: Responding to the Transgender Movement, at Christendom College on Monday, November 19. Frequently seen on television and a nationally-regarded expert on the topic of religious liberty, Anderson’s talk will also launch Christendom’s Major Speakers Program for the fall of 2018 and will begin at 7:00 p.m. in the college’s St. Lawrence Commons. 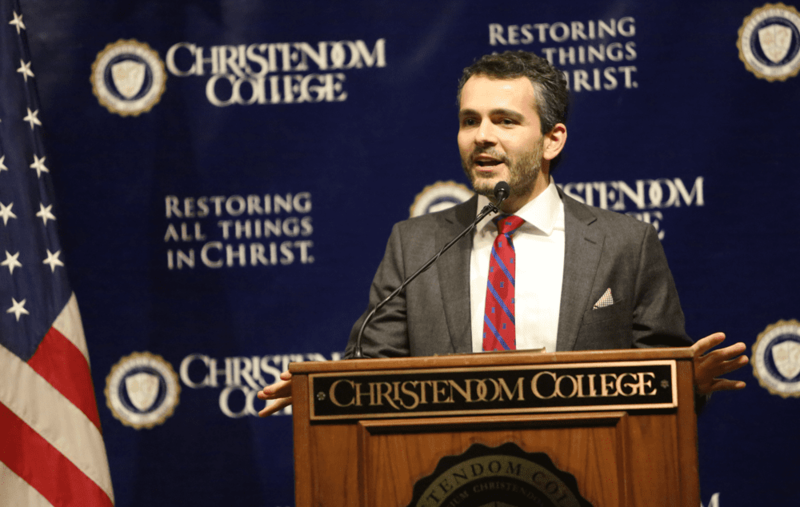 Anderson is a friend of Christendom and this will mark his third time visiting the college, after previously speaking on the future of marriage. Anderson is the William E. Simon senior research fellow at The Heritage Foundation and is also the founder and editor of Public Discourse, the online journal of the Witherspoon Institute. Author of When Harry Became Sally and Truth Overruled, Anderson’s research has been cited by two U.S. Supreme Court justices, Justice Samuel Alito and Justice Clarence Thomas, in two Supreme Court cases. Anderson has made appearances on ABC, CNN, MSNBC, and Fox News, and his work has appeared in the New York Times, the Washington Post, the Wall Street Journal, and the National Review. Christendom College’s Major Speaker Program is an important aspect of the academic life at the college, offering the students and community an opportunity for cultural, intellectual, and spiritual enrichment beyond the classroom. The program offers students the opportunity to gain greater insights and depth of understanding of important issues, and to interact personally with a wide range of men and women who are shapers and critics of our society.